For many years, I dreamed of going back to school someday. I had enjoyed my time in college so much that I fantasized about being back there. I was certain that one day, if I had enough money, I’d stop working and go back to school. Then after my divorce, I moved into a condo and suddenly had extra time on my hands. I started doing fun things in my free time that ended up satisfying my yearnings for school in new and surprising ways. Since then I’ve become a devoted lifelong learner. And it all began with saying yes to things. Make My Own Furniture? Yes! First, I needed furniture. I was very drawn to the character of furniture made from reclaimed items—not only for the look, but the creativity involved in repurposing one thing for another. I was annoyed with how expensive it all seemed and thought…maybe I could do it myself. A quick look on Craigslist drew me to a warehouse at the Lemp Brewery that felt like the Room of Requirement from Harry Potter. It was a giant space full of reclaimed items and a million stories to tell. The first thing I found was a fire place mantel. It full of dust and dirt, but I liked the structure. The man who owned the place asked me what I was going to do with it, and I told him I wanted to make it into an entertainment center. Being an amazing carpenter himself, he grabbed a yellow pad and sketched a quick design to help me with my goal. He even helped me get it up four flights of stairs into my condo! Once home, I began working on this project evenings and weekends—cleaning, stripping mismatched paint, adding stain, building shelves, and running some wiring. It was so fun seeing it all come together. And upon completion, for about $250, I had a 120-year-old fireplace mantel that had been rescued from an old drugstore in St. Louis as my entertainment center. After this project, the creative part of my brain was awake again. One day a friend of mine asked if I wanted to see an Improv show with him. I had no idea what that was, but I also had nothing else going on, so I said yes. After watching two performances where actors made up an entire comedy show on the spot, I was hooked. Soon I began taking classes at The Improv Shop. At some point in the middle of my year of classes, I realized that I had achieved the feeling I’d been longing for when I imagined going back to school. 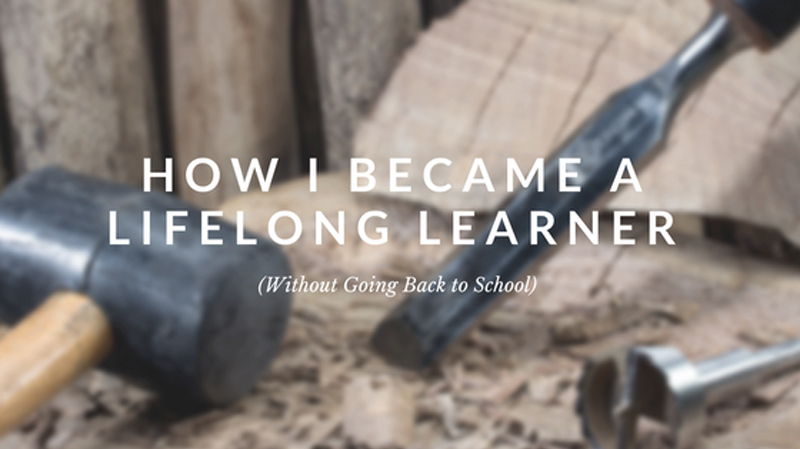 I felt that I was growing in a way and at a rate that I had not done since leaving college. After graduating college, I had certainly and necessarily kept learning and growing professionally to keep up with my field. But adding bits and pieces of information to an existing skill set doesn’t feel the same as tackling a whole new subject. Diving into carpentry and learning to act and improvise woke my mind and soul up in a way that I had not experienced in years. I was so excited to discover this! I am so grateful that I discovered how to become a lifelong learner in my own way—without having to spend hundreds or thousands on college coursework. I’m very thankful that I’m able to spend the rest of my life consciously learning and growing. Even better, my actions have inspired my children to take on projects of their own. They have both spent hours learning programming from the internet and working to create a video game. My younger son is writing a book that he’s been working on for months, complete with soundtrack music (in case it is made into a movie) and a hand-drawn cover image. I’m not saying any of this to brag. I’m just excited by the fact that as I learn, grow, and try new things, I am setting an example for my kids to do the same—in their own way. As I learn, grow, and try new things, I am setting an example for my kids to do the same. What is it that you’ve always wanted to try? That you believe you could do but haven’t started? Or that you’re a little afraid of? 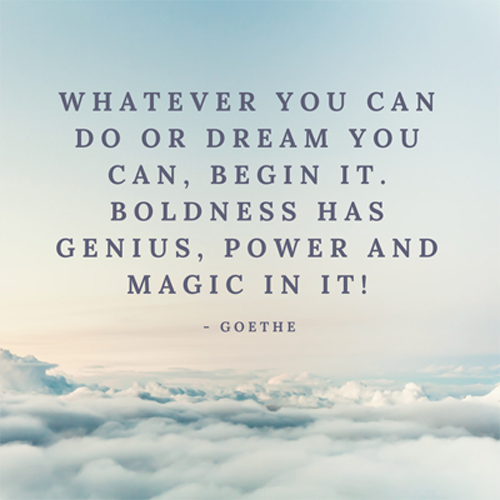 If learning a language, playing an instrument, writing a poem, or going on an adventure keeps arising in your daydreams...do it. Saying yes to that dream will help you grow in ways you cannot imagine. You will meet new people and have amazing experiences that will draw you to the next exciting adventure. Don’t let time or money discourage you. Planning and working toward a dream is half the fun! If you want to brainstorm, please let me know. Contact me online or email Carlo@IntegralWealth.net. Many friends have taken me up on this offer and are now working toward such exciting futures.